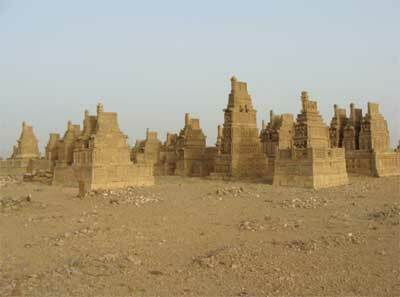 This paper deals with the tombs of the Burfats in small village Taung in Thana Bula Khan. There are four graveyards Rankan Waro or Mehmmod jo Qaburistan, Jam Lohar jo Muqam, Jam Aali jo Muqam and Boshen jo Muqam in and around Taung which are generally called Taung tombs. In this paper, the author has discussed about these four graveyards which are located south and north of Taung village respectively. The author has also discussed the role of the Burfats tribe in the socio-political history of Sindh. While discussing the role of tribe, particular attention has been given to illustrious dignitaries of the tribe. Thana Bula Khan is a major town in Kohistan and a tehsil of Jamshoro district. It is situated some 140 km from Karachi and 66 km from Hyderabad. Thana Bula Khan, which is believed to have been founded by Bula Khan Numerio, has much to offer in terms of history, culture and archaeology. Thana Bula Khan has sandy plains and a barren rocky terrain to traverse. Small hills and Nains (perennial rivers) add beauty to the landscape of Thana Bula Khan. The major towns and the villages of Than Bula Khan tehsil are Thana Bula Khan, Noorieabad, Kalo Kohar, Sari, Mol Sharif, Taung, Karchat, Thano Ahmed Khan (founded by Ahmed Khan Burfat great grand son of Malik Pahar Khan), Thano Arib Khan and Ali Murad Barijo. The main perennial rivers that traverse the landscape of Thana Bula Khan are Baran, Mol, Desvi, Drigh Loyachh and Morai. The Hindu and Muslim tribes, namely, the Khaskhelis, the Pallaris, the Barijas, the Chhuttas, the Rinds, the Gabols, the Brihmanis, the Shoras, and various lineages of the Burfats notably the Hamalanis, the Loharanis, the Baparanis, the Musas, the Kanaras, the Dudhars, the Shanas, Aqilanis, and the Lalanis live in Thana Bula Khan tehsil. Of these the Burfats are quite prominent who ruled the area for many centuries and left their imprints in the form of the monuments in various villages and towns of Thana Bula Khan. The Burfats claim their descent from Jam Burfat son of Jam Essab Numrio. Some scholars believe that Jam Essab was son of Jam Hothi, who moved out of his ancestral area of Wango-Wilasyo, now comprising the districts of Hyderabad Tando Muhammad Khan and Badin (Baloch 1970: 45), with eight persons who belonged to Samejah (Mirak, 1994) and others argue that Jam Essab came from Rajputana along with eight persons and settled in Makran. Baloch argues that there were nine persons including Essab and his four brothers Lalo, Buro, Charo and Shoro, a slave, a singer and two others person who were called Nuhmardi literally meaning nine men. Over a period of time word Nuhmurdi changed into Numrio (Baloch, 1970) However, one finds the word Nuhmardi written on the tomb of Jam Lohar. The Burfat is the valiant tribe of Sindh. They played a very important role in the socio-political history of Sindh during the reigns of the Sammas (1350-1520) the Arghuns (1520-1555), the Tarkhans (1555-1612) the Mughals (1590-1700), the Kalhoras (1681-1783) and the Talpurs (1783-1843). When the Arghuns supplanted the Samma dynasty, the Burfats, who are also an off-shoot of the Sammas, launched a guerilla war against them. They used to ransack the villages and towns which fell under the dominion of the Arghuns and unleashed the reign of terror (Mirak, 1994). The Arghuns were terribly scared of the rising guerilla tactics of the Burfats. They were unable to subdue the tribe. The Mughals bestowed some jagirs upon them. Likewise, the Kalhoras also gave them importance by bestowing jagirs upon them. One of the descendants of Jam Hamal was Malik Pahar Khan who was considered as a cultural hero in the annals of the Burfats. He established his rule in Kohistan and Las Bela in 1705 A.D. After establishing his rule in these areas, he began setting his eyes on the Kachho area of Dadu. The Kachho area was under the dominion of Mian Yar Muhammad Kalhoro (1701-1718). He also invaded some areas of Sehwan. 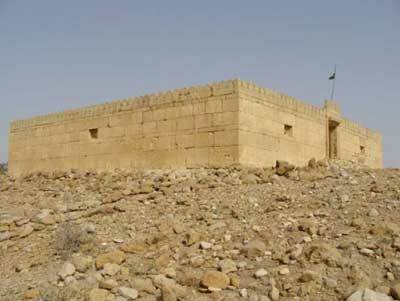 In order to rein in the brinkmanship of Mailk Pahar Khan Burfat, Mian Yar Muhammad Kalhoro decided to invade his headquarters in 1705 and defeated him (Baloch 1970). After that defeat, he dumped the idea of capturing the Kachho and set his eyes on the Hub and Gadap areas of Karachi and Lasbela which he successed in consolidating them. During the reign of Mian Noor Muhammad (1719-1753), Malik Pahar Khan became close to him. Mian Noor Muhammad Kalhoro bestowed some Jagir upon him and used him against some tribes in Kohistan and Lasbela. 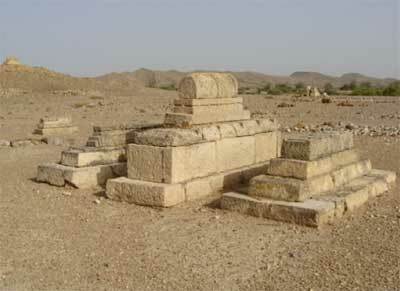 Malik Pahar Khan died in 1741 and was buried in the necropolis of Pir Tearo near Uthal in Lasbela. His wife Mai Chagali became the new ruler of Kohistan and Lasbela. During her reign, the Roonjhas managed all the affairs of the government. However, Jam Aali, the headman of Kaureja tribe, after the murder of his brother by Roonjhas snatched the Bela from Mai Chagli and established his rule (Baloch, 1970). Mai Chagali migrated to Sindh and settled in Kotri where her tomb is situated. Later on, her son Malik Izzat Khan Burfat became the general of Mian Ghulam Shah Kalhoro (Mahar, 1996; Lakho, 2004). He displayed his heroism in many battles. He died in 1776 and buried next to his mother’s tomb in Kotri. The tombs of Mai Chagli and Malik Izzat Khan Burfat are located near the government degree college, Kotri. Besides, Pahar Khan and Malik Izzat Khan, there is another very celebrated person from the family of the Burfats, Bula Khan Numerio/Burfat who was a chief of the people (Baparani Burfats) of hill country during the reign of Mian Noor Muhammad Kalhoro. Mian Noor Muhammad had bestowed a jagir upon him. Bula Khan also helped the generals Shaikh Shukarullah, and Bilawal Naich of the Kalhora army in 1747 against the Rana of Dhareja in Thatta (Qani, 1989; Beg, 1999). He was also known as Bula Khan Jakhro. Some scholars believe that the Jakhars are also from the lineage of the Burfats (Vogel, 1902-1903; Beg, 1999). The tomb of Bula Khan is located in Mangho pir, Karachi. There also lie the tombs of Malik Sapdar son of Malik Harun Burfat and Malik Duha son of Malik Harun (Hasan, 1996) close to the tomb of Malik Bula Khan. The landscape of Kohistan is dotted with a number of historical graveyards. However, the necropolis of Jam Lohar in Taung is quite prominent. Taung is a fertile and picturesque town in the Kohistan. It was believed that the city was founded by Taunger Rai possibly during the rein of Rais of Sindh when Buddhism was the state religion. He might have been the Buddhist ruler of the area. Some people believe that meaning of word Taunger is rich. A person who ruled over the present area of Taung and Tiko Baran was rich that’s why he was called Taunger. Taung is phonetic variation of Taunger. One can still find some remains of the Buddhist site at Akh Pati near Taung village. Taung is located some 70 km from Thana Bula Khan town. It has some prehistoric sites namely Miri to boast (Lambrick, 1986). It had been a centre of cultural and political activities during the rule of the Burfats over Kohistan and Lasbela. Fig. 1: View of Taung Tombs. The necropolis of the Burfats is located on a small hill and conspicuous from the distance. Generally, the tombs located in and around Taung village are known as Taung tombs (fig. 1). There are more than 392 tombs, locally called Rumis meaning “embellished stone tombs” that dot the landscape of the necropolis. A term Rumi refers to simple undecorated to complex decorated stone tombs otherwise called as Chaukhandi. I will not go into the details regarding the term Rumi. However, in this paper, i will be using term Rumi for stone tomb instead of Chaukhandi as used by the scholars who have worked on these structures. People of Taung refer to these types of tombs as Rumis. In my study in Thana Bula Khan I never found people calling these structures as Chaukhandi tombs. Rather they use term Rumi for both old and newly built stone tombs. 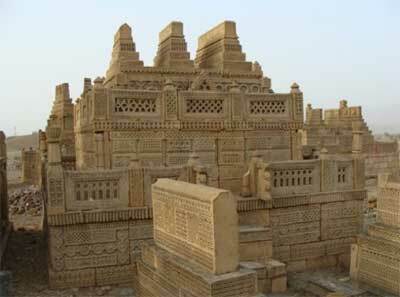 The tradition of constructing Rumis still continues in Thana Bula Khan tehsil of Jamshoro. Most of the Rumis belong to the Loharani lineage of the Burfats. It also contains the tombs of other lineages of Burfats and those who served them. The necropolis of Burfats can be divided into three groups namely eastern, western and northern carrying the names of Jam Mehmood, Jam Lohar, and Jam Aali/Aari respectively. Apart from these graveyards, there is another cemetery which is located 2 km north of the Jam Lohar’s graveyard and is locally called Boshen Jo Qaburistan (Boshi graveyard) probably belonging to those who served the Burfats. The eastern necropolis contains the oldest tombs as compared to the graveyard of Jam Lohar. The main tomb in the eastern necropolis belongs to Jam Mehmood which is located inside the funerary wall enclosure (fig. 2). Fig. 2: Funerary Wall enlsoure of jam Mehmood. Jam Mehmmod is believed to have been a father of Jam Aali/Aari and grandfather of Jam Lohar.The entrance of the enclosure has some decoration on the either side. There are six tombs inside the funerary enclosure. However, the most impressive tomb belongs to Jam Mehmood which is located close to the western wall of the Rank (Funerary wall enclosure). The tomb of Jam Mehmood is erected over two undecorated slabs superimposed with two chambers and three decorated covering slabs (fig. 3). The gravestone or headstone of the tomb has intricate carvings with decorative niches below the turban on either side. The distinctive feature of the tomb is the corner bedstead on the both chambers the lower and the upper. The niches on southern and northern side of the tomb are remarkable. The niche is flanked by two small pillarets on either side. The tomb of Jam Mehmood has no parallel in terms of such impressive decoration in whole of Thana Bula Khan and other parts of Sindh where one finds such tombs. Fig. 3: Tombstone or Rumi of Jam Mehmood. The tomb does not have any inscription. According to legend he was father of Jam Aari/Aali. But in the family genealogy, the name of Jam Samrook appears as father of Jam Aali. The decoration and aesthetic indicate that tomb does not belong to ordinary personage rather to an important and influential dignitary of Burfat tribe. People believe that this tomb is the oldest structure in the necropolis. 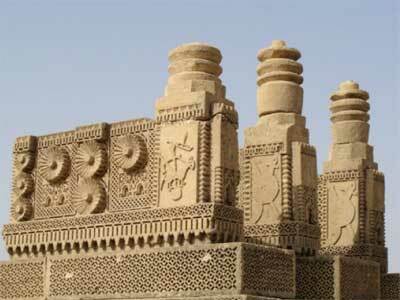 Besides, the tomb of Jam Mehmmod, there is six other Rumis that are located inside the wall enclosure. Of these, however, one is noted for peacock and snake design (fig. 4). The artist has engraved the snake on the entire gravestone from south to north. Peacock is shown holding snake in its beak. This is really superb piece of art which one hardly finds elsewhere in Sindh. Though, there is peacock and snake motifs on other Chaukhandi tombs in different graveyards located in Karachi and Thatta districts but not such impressive and remarkable motif as seen in the tomb in the wall enclosure of Jam Mehmmod. One also finds the similar motif of peacock and snake in the tomb of Bapar Aali in the necropolis of Jam Lohar. 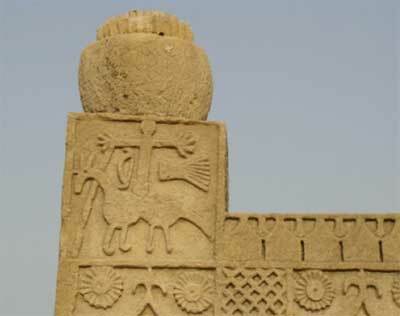 An unidentified tomb in the Boshi graveyard 2 km north of Taung also depicts the similar motif. 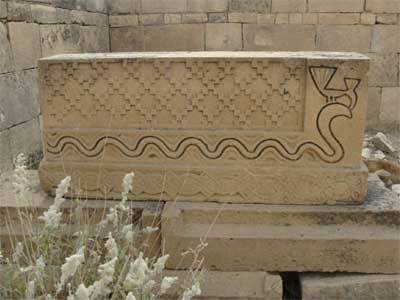 The depictions of peacock and snake motif can be seen in some other tombs at Sonda and Lakho Pir graveyards (Hasan, 1996; Zajadacz-Hastenrath, 2003). The peacock with serpent is also found on the canopy structure covering of Badi-uz-Zaman, dated 1602, in the funerary complex of Baqi Khan at Makli (Zajadacz-Hastenrath, 2003). Peacock and snake represent the symbol of cosmic victory from time immemorial (Hasan, 1996). Fig. 4: Peacock and snake motif on the Rumi, in the necropolis of Jam Mehmood. Based on the local mythology, I believe that peacock is symbol of beauty and life where as the snake is symbol of death. This motif of peacock holding snake in its beak symbolizes life defeating or overcoming death. This motif has been the favourite design of the Sindhi artists which can be seen in both the painted tombs of Larkana, Dadu, Nawabshah, Sanghar and other districts of Sindh and on Chaukhandi/Rumi tombs in Karachi, Jamshoro and Thatta districts. There are many cenotaphs outside funerary enclosure of Jam Mehmood which are noted for intricate decorations. To west of the funerary enclosure at the walking distance are located four tombs on the undecorated raised platform. These graves depict geometric and floral designs. There are more than 80 tombs in the necropolis of Jam Mehmmod or Rankun waro Qabursitan. Most of the tombs have two chambers and some has three chambers. A very few are the low lying graves and one chambered. Some tombs also depict jewellery, horserider and arms and armour. One of the tombs located east of Jam Mehmood’s enclosure depict horserider. The rider is shown standing on the horse and holding bridle. He appears to be wearing perhaphs cap or turban (fig. 5). But he is not shown with outstretched arms as found on the other tombs in Karachi and Lasbela districts (Hasan, 1996). This depiction is found on the rear side of the headstone unusual to the decoration principle as most of the tombs depict the motif underneath the boss. Fig. 5: Representation of rider with extended arms and headgear, the necropolis of Jam Mehmood. 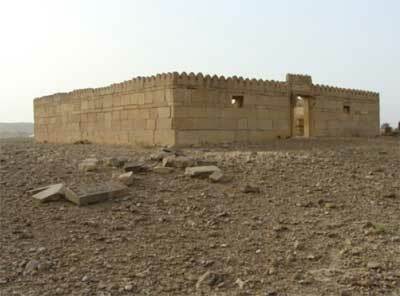 To northeast of the Jam Mehmood’s funerary enclosure are the three tombs of which an eastern tomb bears the horse rider. In this depiction rider is standing on the horse with extended arms. A quiver and bow is seen on ether side of the figure. 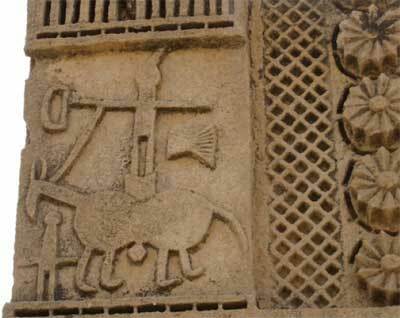 There is a spear overlapped by horse’s head (fig. 6). Fig. 6: Depiction of Rider with extended arms, the necropolis of Jam Mehmood. Nevertheless, this motif of rider standing on the horse is found on other tombs in Tanug especially in the necropolis of Jam Lohar (fig. 7). The rider is shown wearing a pointed helmet. Two weapons on the left and right of the hands of the rider are also shown. The gravestone also depicts footmen with outstretched arms in the lower left corner. There are at least eight tombs depicting the motif of rider standing on horse in the Jam Lohar’s graveyard. In another gravestone (Fig .8), rider is shown standing on horse with extended arms, holding a bridle of horse in his right hand. Rider is shown wearing a turban. On the lower right corner and the front legs of horse is shown a follower with outstretched arms. A bow and arrow is on the rider’s right and on the left is a quiver and spear overlapped by horse’s back. Fig. 7: Representation of a rider with extended arms and escorted by footman, the cemeter of Sakhi Jam Lohar. Fig. 8: Another rider standing on horse escorted by attendent, the necropolis of Sakhi Jam Lohar. One also finds similar motifs in many tombs at Hinidan, a necropolis which belongs to Jakharas (Vogel 1902-3) a lineage of Samma tribe. There are at least six tombs at Hindan depicting such motif. Zajadacz-Hastenrath (2003) also describes various such motifs in Sindh and Baluchistan. Similar motif of man standing on horse and appears to be engaged in fighting is found in many rock art sites of Nain Nali and Gaj perennial rivers in Dadu district (Kalhoro 2009). Dani (1985) believes that this type of motif belongs to white Huns because they were very much skilled and they used to fight while standing on their horses. Images of such riders standing on horses are found on the rock art sites of Chilas and sacred Rock of Hunza (Dani, 1983; 1995; Jettmar and Thewalt, 1987; Bandini-Bemmann-Hauptmann, 1997). Similar images are also noticed in the petroglyphs of Chiniot in Pujnab (Kalhoro 2010). Therefore, I believe that this motif is the survival of the old traditions of Sindh which persisted on the Chaukhandi or Rumi tombs of Sindh and Baluchistan. To east of funerary enclosure of Jam Mehmood are two tombs built over the plinth. The plinth was decorated with corner posts and stone punctured screens. The latticework and corner posts have collapsed. The eastern tomb with jutting out slabs depicts weapons. The depicted weapons are the swords, shields, spear and dagger. To south of this tomb is the row of five tombs erected over double plinth. The distinctive feature of these tombs is the corner shafts and posts on the both lower and upper platforms. Close to this double platform graves; is a tomb depicting sword, shield and jar on the gravestone. There are at least five tombs in the necropolis of Jam Mehmood which depicts the weapons. There is a tomb in this necropolis which bears horse without rider. The legs, ears and tail of the horse are elaborately represented. The spear is shown lying on top of the body of the horse. The road passing through the both graveyards separates them into two groups eastern and western. The eastern graveyard which is called Rankun Waro or Mehmood’s graveyard is half kilometer away from the main shrine of Jam Lohar. The western one is called the necropolis of Jam Lohar. The principle tomb in the necropolis belongs to Jam Lohar, the ancestor of the Loharani lineage of the tribe. According to legend Jam Lohar was son of Jam Aari/Aali. Jam Aali had four sons including that of Jam Lohar. His other three sons were Jam Hamal, Jam Bapar and Jam Baadin after whom sprang the lineages of the Hamalanis, the Baparanis and the Mardois. The Mardois live in the Baluchistan (Baloch, 1970; Syed, 1979). There are five tombs in the necropolis of Jam Lohar that bears the inscription. The tomb of Jam Lohar bears the inscription on the projected lower slab as Lohar Aali Nuhmardi. There are three other Rumis which belong to his son Jam Nindo and his daughter Moldi and wife. The Rumi of Jam Lohar has three chambers superimposed with three decorated covering slabs, gravestone and turban indicating the status of the deceased. Legend says that he led a virtuous life and did not take interest in worldly affairs. After the death of his father, he declined to be chief of the tribe. If he did not take part in the tribal politics then who led the war parties? We know that the Nuhmardis or Numrias fought against many tribes during the reigns of the Arghuns and Tarkhans (Mirak, 1994; Syed, 1979; Baloch, 2005; Hasan, 1996). Did Jam Baparo or Jam Hamal lead the war parties? But they had their respective dominions to rule and tribes to dispense the justice. I believe that Jam Lohar’s son Jam Nindo or his grandson Jam Hakeem might have played some role in the tribal politics that’s why there is such huge necropolis containing impressive and huge Rumis of the Loharanis. If the Loharanis did not take part in the tribal politics, why these tombs were erected? I believe that these tombs were erected to commemorate the heroism of the Loharanis and other lineages of the Burfarts. Loharanis Burfats played a major role in the tribal system which is attested by these amazing structures located in Taung. The mausoleum of Jam Lohar has been recently constructed over the Rumi by the Hindu community of Thana Bula Khan who held a great reverence for him (fig. 9). To west of the shrine of Jam Lohar Aali is situated a Rumi of Khihyoon bin Marjook. The Rumi of Khihyoon is one chambered and erected on two undecorated base slabs superimposed by five covering decorated slabs and gravestone. The distinctive features of this Rumi are the inscription and the weaponry depictions found on the gravestone. The inscription bear the name of Khihyoon bin Marjook. The gravestone or the upper stone depict the quiver, bow and arrow. He was believed to have been played a very active role in various battles that Burfats fought against other tribes. He was grandson of Jam Hamal thus belonged to Hamalani lineage of Burfats. Jam Hamal had three sons, Jam Marjook II, Usman and Chaglo. After the death of Jam Marjook I, Jam Khihyoon became the new chief of the Hamalanis (Baloch, 1970). And after the death of Jam Khihyoon his son Jam Marjook II became the chief of the Hamalanis. Fig. 9: Shrine of Sakhi Jam Lohar, the necropolis of Jam Lohar. To west of the Rumi of Jam Khihyoon are located tombs of Jam Baparo and his son Jam Soomar erected on the common two base slabs. The Rumi of Jam Baparo is noted for its figural representations on the upper slab or gravestone. It depicts the horse rider, archer, snake and peacock, quiver, bow and arrow (fig. 10). This Rumi bears the name of Baparo Aali. Close to this is a Rumi bearing the name of Soomar Baparo. Fig. 10: Figural representations on the Rumi of Jam Baparo, The necroplis of Sakhi Jam Lohar. It is believed that after the death of Jam Aali, his eldest son Jam Lohar refused to be chief of the tribe and rather preferred to lead a virtuous life. Therefore, chieftainship was divided between his two sons Jam Baparo and Jam Hamal. Jam Baparo became very strong chief of Baparani lineage of Burfats whereas Jam Hamal was the chief of Hamalani Burfats. Many tribes including Pallaris, Heliyas, Hamatis Gandaras, Jakharas, Soomras, Jakhras and Khaskhelis were under his chieftainship of Jam Barparo and under the chieftainship of Jam Hamal were the following tribes the Hamalanis, Aqilanis, Loharanis, Lalanis, Musa, Dhudhars, Chhenas, Shoras, Brihmanis, Chhuta, Roojanjhas, Kanaras, Buras, Changs, (Baloch, 1970). After the death of Jam Baparo his son Soomar Bapro whose tomb is located close to his father, became new chief of his tribe. However, some scholars believe that Jam Tamari became chief after the death of Jam Baparo (Baloch, 1970) and others state that Jam Bahadur successed his father as chief of the Baparanis. I believe that Jam Tamari was not son of Jam Baparo as shown in the genealogy but was his grand son and son of Jam Soomar. To north of the Rumis of Jam Baparo and Jam Soomar Bapar, is situated a tomb of Qaim Khan. It bears the name of Qaim Khan with date but except the name inscription is not clear to read. The Rumi of Qaim Khan is erected over a double base slab. The lower base slab is undecorated whereas the upper is decorated with small corner posts. It is three casket tomb (fig. 11). The lower casket is also decorated with similar corner posts found on the base slab. The central chamber is decorated with bedposts, a charpoy motif, found almost on every Rumi in the graveyard of Jam Lohar. The upper chamber is crowned with five decorated covering slabs and gravestone. Fig. 11: Rumi of Qaim Khan, the necroplis of Sakhi Jam Lohar. 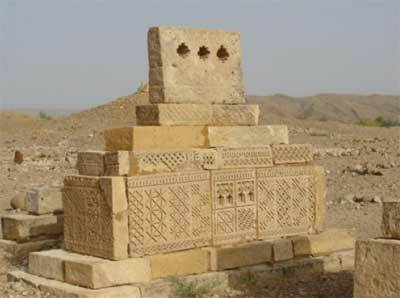 In the necropolis of Jam Lohar there are some Rumis enclosed by stone balustrade depicting geometric and floral designs. Both single and double stone balustrades are found in the necropolis. The double stone balustrade (fig. 12) is only peculiar to this graveyard not found elsewhere in Sindh except one at Tak Makan, which belongs to Mondar Pallari (fig. 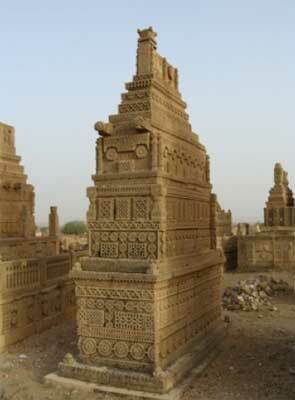 13) Although there is single stone balustrade found in other graveyards of Sindh. Fig. 12: Rumis enclosed by double stone balustrades, the graveyard of Sakhi Jam Lohar. Fig. 13: Rumis of Mondar Pallari enclosed by double balustrades. Likewise we find double plinth tombs in the graveyard of Jam Lohar. There are some Rumis raised on double plinth (fig.14). The double plinth tombs are situated west of the shrine of Jam Lohar Aali. The lower plinth is decorated with nook shafts. On the upper plinth rest the caskets supported by five pyramidal slabs with tall gravestones. Fig. 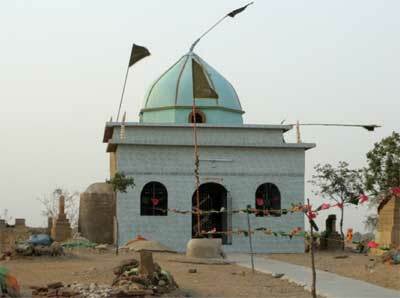 14: Rumis raised on double plinth, the grave yard of Sakhi Jam Lohar. The distinctive features of the Rumis in this graveyard are the tall gravestones divided into two to four sections with each section depicting a variety of floral, geometric and figural motifs. The gravestone/headstone surmounting on the tombs of the notables are more refined as compared to the ordinary people or those who served the Burfats. The space just below the boss is reserved for the figural depictions whereas other sections depict the floral and geometric designs. But on some gravestones only the arm and weapon designs occupy the whole space. One of the gravestones is divided into two sections, first section is decorated with arch enclosed by geometric designs and the second part or section below the turban or boss is two depictions. The first representation is of rider standing on horse with extended arms holding the reins in his right hand. To left of the rider are bow and arrow and quiver and on the right is a spear overlapped by horse’s neck. The second depiction is of decorated sword crossing the decorated shield with rosette in the centre. Both sections and parts of the gravestone are separated by pillarets with attached miniatures turbans or bosses. There are total three pillarets which are decorated with chevron lines. As compared to other graveyards in Sindh, the tombs in the necropolis of Jam Lohar are decorated with a large number of weaponry depictions. To north of Jam Lohar’s shrine are three Rumis erected on raised platform, the gravestones of these Rumis are decorated with arms and rider depictions (fig. 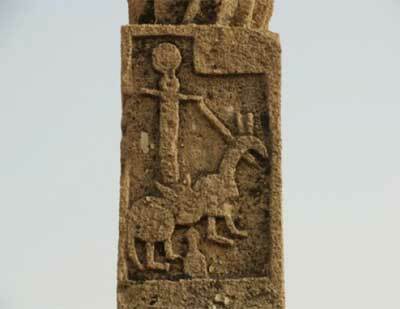 15) The first grave stone depicts a rider standing on horse with outstretched arms holding a bridle in his right hand. On the upper right corner is a depiction of bow and arrow and on the lower left corner are the depictions of quiver and spear overlapped by the horse’s body. The two other gravestones show shields with swords and spears crossing behind them. Apart from this graveyard, one finds many weaponry depictions on the tombs at Oongar necropolis (Kalhoro 2009). The Rumis of the women depict a variety of jewellery. Fig. 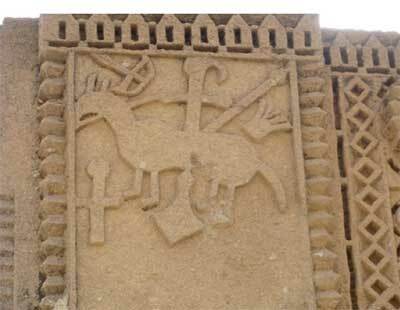 15: Grave stones of Rumis depicting a rider and weapons, the graveyard of Sakhi Jam Lohar. The funerary wall enclosure of Jam Aali is located north of Jam Lohar’s shrine on a hill (fig. 16). He is also called Jam Aari. But as seen on the tombs on his sons, it is written as Aali not Aari. Fig. 16: Funerary enclosure of Jam Aali, the graeyard of Sakhi Jam Lohar. There are at teast 10 Rumis inside the wall enclosure of Jam Aali. The principle Rumi belongs to Jam Aali. It is one chambered Rumi erected over double base slabs. The chamber is crowned with three decorated covering slabs and gravestone. The eastern slabs of the chamber are in bad sate of preservation. 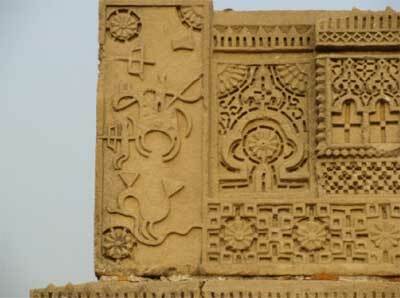 The northern and southern slabs are decorated with symbol of sun disc. The gravestone carries intricate engravings. Jam Aali was made a chief of the tribe after the death of his father Jam Jamrok. His grand father Jam Samrok was also a chief of his tribe. Some scholars believe that the grand father of Jam Aali was Jam Samrok (Syed 1979). But the descendents of the Jam Lohar living in Taung believe that Jam Mehmood was the grand father of Jam Aali whose tomb, as already discussed above, is situated east of the shrine of Jam Lohar. This necropolis is situated 2 kilometers north of Taung village and lies on road to Tiko Baran. There are more than 40 tombs in the Boshi graveyard. Not a single tomb bears an inscription. There are three styles of Rumis that one finds in the graveyard. First, there are simple Rumis with flat gravestone. In this style three or four slabs are used to construct the Rumi. Two slabs are often set on a base slab superimposed with flat top stone or gravestone (fig. 17). The flat gravestone has generally relief decoration on it. Fig. 17: Rumis in the Boshi graveyard. Second, some Rumis has one casket or one chamber with either barrel shaped or tall gravestones. On the individual slabs of the casket or chamber are the carvings of the large rosette. Similar rosette design is also repeated on the gravestone (fig. 18). In this style, casket or chamber is set on the undecorated base slab with two covering undecorated slabs laid one upon other on the chamber with cylindrical or tall gravestone. The barrel shaped gravestone has three steps decorating the upper or the lower steps. Some elevated or tall gravestones have perforations. There are total four Rumis with punctured gravestone. This style of the punctured gravestone is only peculiar to the Boshi graveyard, not found in the other graveyards of Jam Mehmood, Jam Lohar and Jam Aali. But one finds some Rumis with perforated gravestones at the graveyard in Kohtrash in Thana Bula Khan. Some Rumis has two rectangular cuts on the lower slabs or the chambers. Fig. 18: Rumi with perforated gravestone in the Boshi graveyard. Third, the Rumis gain height with relief decoration which has either one or two chambers with gravestone and attached boss. These Rumis have geometric and floral designs (fig. 19). Majority of the tombs belong to this group. Two Rumis depict arms and weapons where one tomb bears the peacock holding snake motif. Fig. 19: Rumis erected over double base slabs, in the Boshi graveyard. The Rumis belonging to males are decorated with the depictions of riders and weapons while the Rumis of female bear the jewellery depictions. The height of the Rumi indicates the status and position of the dignitary during his life time. The heights of the Rumis range from four feet to eighteen feet. Most of the taller Rumis belong to the descendents of Jam Lohar, Jam Hamal and Jam Bapar. Nowhere in Sindh one can find such taller Rumis as of in the necropolis of Jam Lohar. Apart from this cemetery, there are many graveyards of the Burfats located in Mangho Pir, Mol, Malir, and some Rumis in the Chaukhandi necropolis in Karachi, Oongar in Thatta and Burfat tombs in Kotri town. Usually, these types of the Rumis have one, two or three chambers or caskets. At Chaukhandi necropolis and Shaikh Lako graveyard at Memon Jo-Goth in Karachi, one finds Rumis having either two or three caskets. But here in the necropolis of Jam Lohar at Taung, there are many Rumis which have four caskets or chambers. The distinctive feature of these Rumis is the addition of charpy motif (decorative bed post) on the fourth chamber of the structure. Usually, one finds the motif either on the lower platform or first or second chambers. The artists have excessively used these motifs on the Rumis reflecting the aesthetics of both artists and owners. Another feature of the tombs is large number of figural depictions on the gravestones. 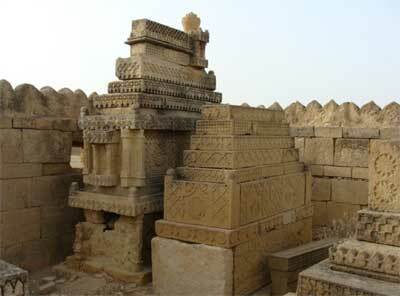 If one compares these Rumis with various other similar structures at the graveyards of Chaukhandi, Goth Raj Malik, Shaikh Turabi, Dars Warayo, Shah Hussain, Pir Qureshi, Jungshahi, Pir Lakho, Oonghar, Sonda, Pir Patho, one does not find a large number of figural representations particularly weaponry depictions on the gravestones or headstones. I have visited all the above mentioned graveyards, but have not found such taller gravestones or headstones. The tombs of the members of royal family are either built on double platform or there is a beautiful stone balustrade around the structures. These Rumis have more decorations compared to the others. The tombs of the Burfats in Taung are fabulous pieces of art. The concerned authorities should chalk out a strategy to promote tourism in the area. Unfortunately, a very few people know about this cemetery. Like the necropolis of the Chaukhandi in Karachi, this site has also much potential for tourists. Baloch, N. A. 1970. Belayan-Ja-Bo. 2nd ed. Hyderabad: Zeb Adabi Markaz. Baloch, N. B. 2005. Jang Nama (War Ballads). Tando Wali Muhammad-Hyderabad: New Fields Publications. Beg, Mirza Qalich. 1999. Qadim Sindh, Un Ja Shahar ain Mano. 4th ed. Jamshoro: Sindh Adabi Board. Brohi, Ali Ahmed. 2005. History on Tombstones Sindh and Baluchistan. Jamshoro-Hyderabad: Sindhi Adabi Board. Bunting, Ethel-Jane W. 1980. Sindhi Tombs and Textiles: The Persistence of Pattern. Albuquerque: The Maxwell Museum of Anthropology and University of New Mexico Press. Cousens, Henry. 1975. 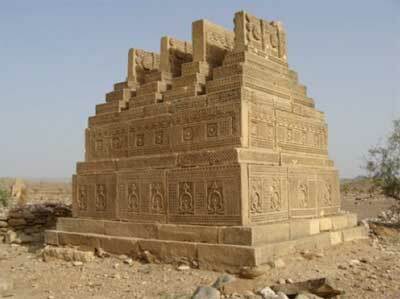 The Antiquities of Sind: With Historical Outline. Karachi: Oxford University Press. Dani, Ahmed Hasan. 1983. Chilas: The City of Naga Parvat (Dyamar). Islamabad: centre for study of Central Asia. Dani, Ahmed Hasan. 1985. The Sarced Rock of Hunza. Journal of Central Asia vol. VII, (2), pp. 5-124. Dani, Ahmed Hasan. 1995. Human Records on Karakorum Highway. Lahore: Sang-e-Meel. Hasan, Shaikh Khurshid. 1975. Pictorial Representation on Muslim Tombs in Sind. Sind Quarterly 1(1), pp. 35-43. Hasan, Shaikh Khurshid. 1981. Stone Carving from Historical Monuments at Makli Hills. In: The proceedings of Hijra Celebrations Symposium on Islamic Art, Calligraphy, Architecture and Archaeology, vol. 1 University of Peshawar: Department of Archaeology, pp. 67-75. Hasan, Skhaikh Khurshid. 1984. Stone Relief from Chaukhandi Tombs in Pakistan. East and West 34(3), pp. 189-198. Hasan, Shaikh Khurshid. 1996. 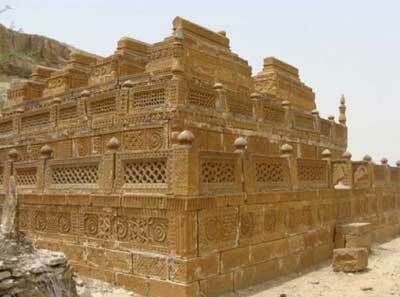 Chaukhandi Tombs in Pakistan. Karachi: Royal Book Company. Hasan, Shaikh Khurshid. 2001. Chaukhandi Tombs. In: The Islamic Architectural Heritage of Pakistan: Funerary Memorial Architecture. Karachi: The Royal Book Co., pp. 98-100. Jettmar and Thewalt. 1987. Between Gandhara and the Silk Roads: Rock carvings along the Karakorum Highway. Mainz am Rhein. Kalhoro, Zulfiqar Ali. 2009. “Tombstones of Fallen Heroes”. Suomen Antropologi, Journal of the Finnish Anthropological Society 34(3), pp. 44-55. Kalhoro, Zulfiqar Ali. 2d May 2010. Chiniot Rock Art at the mercy of Stone Crushers. Dawn. Lakho, Ghulam Muhammad. 2004. Kalhora Daur Hukumat (History of Kalhora Period), Anjuman Ithad Abbasia: Karachi. Lambrick, H.T. 1986. Sindh: A General Introduction. 3rd ed. Hyderabad Jamshoro: Sindhi Adabi Board. Lashari, Kaleem. 1996. A Study of Stone Carved Graves. Archaeological Review Vol. 5 Issue I and II. Karachi. Lundkhwar, Ali Mohammad. 1986. Arms and Armour. In: Archaeology of Sindh, edited by Muhammad Ishtiaq Khan. Karachi: Department of Archaeology and Museums, pp. 50-53. Mahar, Ghulam Rasool. 1996. Tarikh Sind: Kalhora Daur (History of Sindh, Kalhora Period). Vol. I&II, trans. Yar Muhammad and Shamsherul Haideri. Karachi: Culture and Tourism Sindh Government. Mirak, Yousaf. 1994. Tarikh-i-Mazar Shahjahani. 2nd trans. Niaz Humayouni, Jamshoro: Sindhi Adabi Board. Qani, Mir Ali Sher. 1989. Tuhfat-ul- Kiram. 3rd ed., trans. Makhdoom Amir Ahmed. Jamshoro: Sindhi Adabi Board. Syed, G.M. 1979. Janab Guzarim Jin Seen. Vol 2, 2nd edition Jamshoro/Hyderabad: Sindhi Adabi Board. Vogel, Jean Philippe. 1902-3. Tombs at Hinidan in Las Bela. Archaeological Survey of India Annual Report, pp. 213-17. Zajadacz-Hastenrath, Salome. 2003. 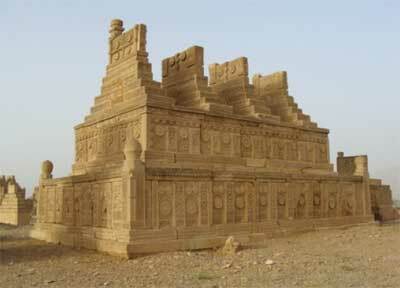 Chaukhandi Tombs, Funerary Art in Sind and Baluchistan. Translated by Michael Robertson: Karachi: Oxford University Press.